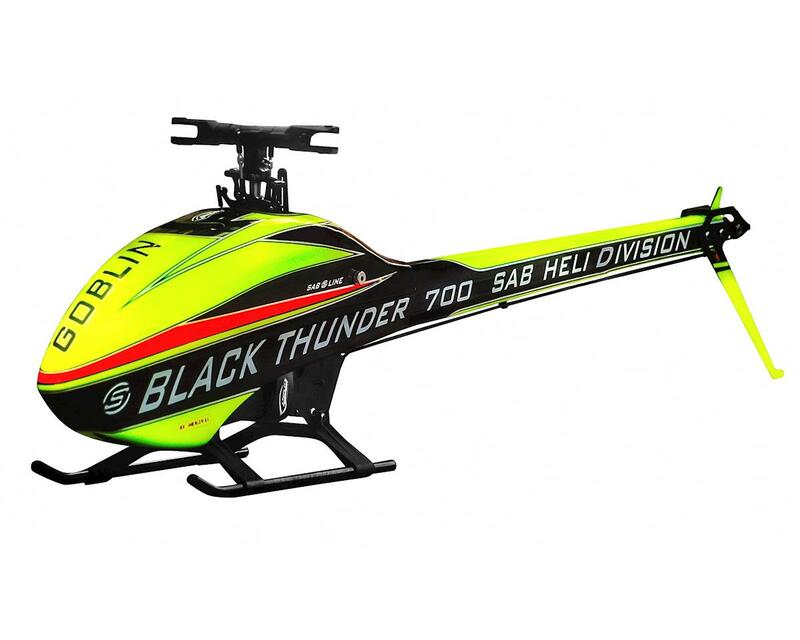 The Goblin Black Thunder Sport 700 from SAB Heli Division provides an incredible cost to performance package by offering a proven and robust platform that is the Goblin Black Thunder Helicopter! By manipulating some included parts within the kit, and additionally removing blades from the kit, SAB has been able to drive down the price of the Black Thunder Sport to an incredibly low offering never found before from SAB for a 700 class machine! Competition winning, proven and stylish design, and original design concepts are all still found at the heart of this helicopter. Modular Power System – Simple, Elegant, Beautiful: With the removal of a small handful of bolts, the entire power system will arise from the Goblin – cyclic servos, engine, rotor system, main gear system – allowing this helicopter to be adjusted and repaired with great ease. Dual Belt Driven Performance – Simple, Robust, Light Weight: By utilizing a belt driven main motor, immense power can be transferred without the fear of gear failure. Belt driven systems are amazingly efficient, incredibly durable, and best of all, belt drive systems are ethereally light in weight, cutting out the complexity, noise and added weight of a torque tube drive system. 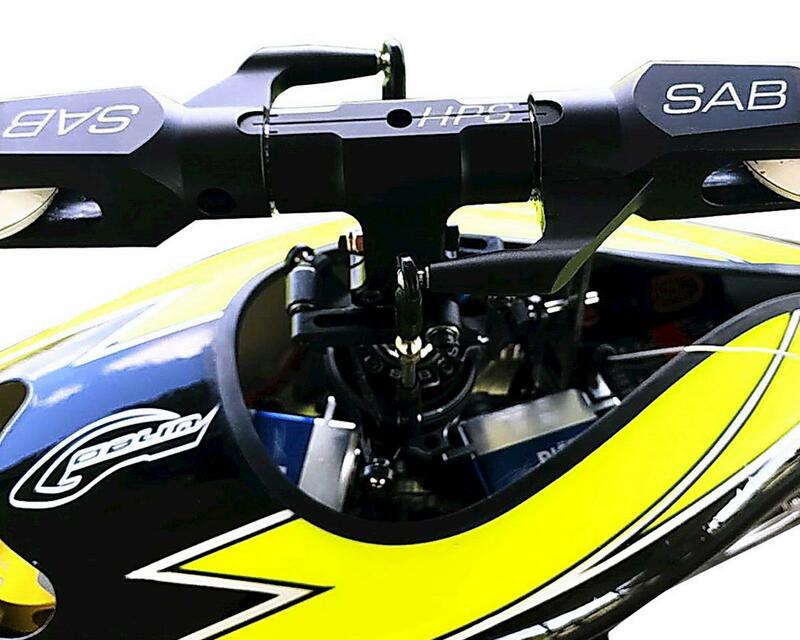 Aerodynamic Boom Shroud – Form & Function in One Beautiful Package: Italian designing takes one step further, coalescing the aerodynamic canopy with a near seamless transition to a carbon fiber tail boom covering. This aerodynamic shroud brings a unique beauty to the SAB Goblin, serving as an aerodynamic element that allows the Goblin to traverse the skies at mach speeds. Speed and power has never looked so good. 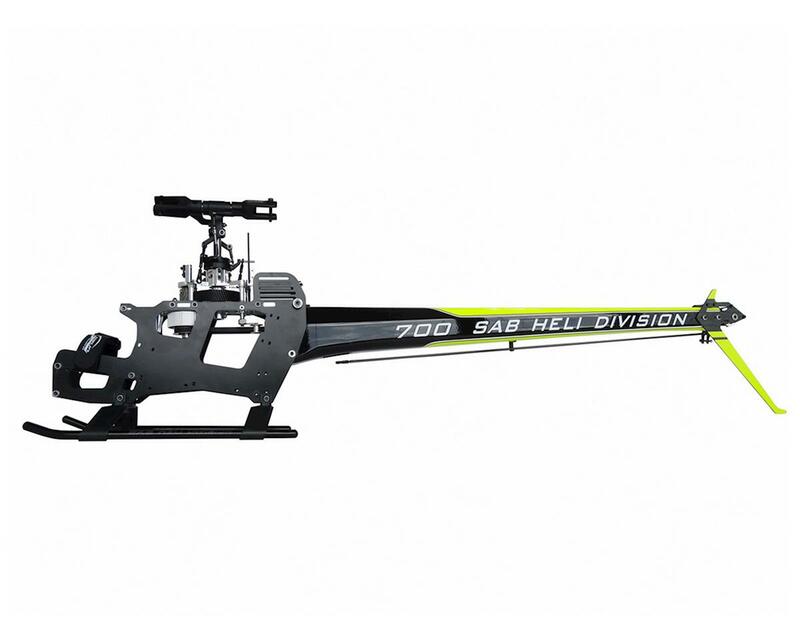 CNC Aluminum Flybarless Main Rotor System – Nothing but the Best: Taking full advantage of flybarless technology, the SAB Black Thunder is offered in a flybarless kit only, utilizing a bearing raced blade grip control system for the absolute in precision & control. Nothing was held back throughout this build, and you can expect nothing less when the Goblin takes flight. Light Weight Build – Power that can be Used Like No Other: By building the SAB Goblin with a keen eye on weight, SAB engineers were able to shave critical weight by utilizing carbon fiber materials & a dual belt driven gear system, which brings the Goblin to new worlds of power & performance.